The dawn of Friday 15 Ramadan 1414 a.h. / 25 February 1994 marked the first of three massacres perpetrated by Israeli settlers accompanied by the Israeli Army. There were more than 30 martyrs and 270 injured. The main massacre toke place while the victims were performing al- Fajr (Dawn) Prayer at Al Ibrahimi mosque. That same day, a Jewish American Zionist physician decided to materialize the dream of the typical Zionist movement of annihilating the Arab existence in Palestine. Dr. Baruch Goldstein prepared for the move. It was during Ramadan when Dr. Goldstein decided to execute his old plan of vengeance. 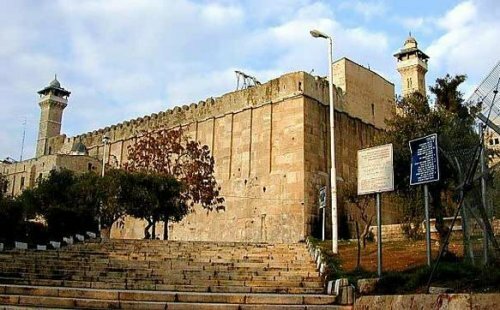 Goldstein passed two army checkpoints at the dawn of February 25, 1994 from the northeastern gate of the mosque near privy. That privy could be the reason why Goldstein decided on that gate because he, probably, received his contemplation about Arabs from the Rabbis of Kach in Kiryat Arab where the Arabs were described as the demons of the privy. The privy of the mosque is important not only because it has two Israeli army checkpoints on its nearby mosque’s gate, but also because it is surrounded by Israeli army posts from the east and army patrols in the west. So Goldstein was acting from the deepest parts of the Zionistic ideology in liquidating the demons. Goldstein walked at least 100 yards in the mosque before he decided to choose the exact location to liquidate his demons. He positioned himself at the last row of the main hall, just opposite to the Imam’s place (Manbar.) In this case and as a typical Zionist, shooting from the back was the style. The position was not arbitrary not only because it enabled him to shoot directly at the largest number of the backs of the worshipers but also because it was supposed to have enabled him to get a fast escape or protection from the Israeli soldiers who were scattered right behind him in the northern hall -the plate- of the mosque. Goldstein was carrying his IMI Galil assault rifle, four magazines of ammunition, which held 35 bullets each and hand grenades. He thought about the best moment to execute the plan, maximize the number of casualties and secure the escape or rescue. The best moment, of course, was when the Muslim worshipers knelt on the floor with their backs towards Goldstein. It was first a hand grenade that he threw among the worshipers causing casualties, confusion, and possibly an invitation to the Israeli soldiers in the halls and outside of the mosque to intervene for rescue. And in no time, the automatic massacre took place with the same kind of mercy that other Zionists like Goldstein shows all the time toward Arabs. Standing in front of the only exit from the mosque and positioned to the rear of the Muslim worshipers, he opened fire with the weapon, killing 29 people and injuring more than 125. He was eventually overwhelmed by survivors, who beat him to death. Zionist colonist Baruch Goldstein, a leader of the fanatic terror organization Kach, enteretd the Ibrahimi mosque in Hebron and killed 29 Palestinian worshippers during dawn prayer. The shooting lasted 10 minutes during which the IOF soldiers stationed outside the mosque did not intervene to stop the massacre, instead they closed the doors of the mosque and prevented worshippers from escaping the massacre. A Jewish settler has killed up to 30 Palestinians at a mosque in Hebron after opening fire as people gathered for Friday morning prayers. US-born doctor Baruch Goldstein, 38, burst into the mosque in the Machpela Cave and fired up to 100 bullets at worshippers, according to state TV reports. Eyewitnesses said Goldstein sprayed people with his automatic Galil rifle, an Israeli-made copy of the Soviet AK47. The shooting spree lasted at least 10 minutes, witnesses added. The mosque was packed with up to 800 worshippers for prayers in the Muslim fasting month of Ramadan. Goldstein, wearing the uniform of an army reservist, was found dead in the mosque after the shooting stopped. Initially, police believed that Goldstein had shot himself but in a later statement they said he had been beaten to death with iron bars. Israeli Prime Minister Yitzhak Rabin telephoned Mr Arafat, describing the attack as a "loathsome, criminal act of murder" and pledging to take "every possible measure to bring about calm". Mr Rabin said Israel would launch an investigation into the killings. The floor of the mosque was full of bodies and blood Mohammad Suleiman Abu Saleh Mosque guard Mohammad Suleiman Abu Saleh said he thought that Goldstein was trying to kill as many people as possible and described how there were bodies and blood everywhere. There were unconfirmed reports that Goldstein had an accomplice inside the mosque. The injured were taken to the Aghli Hospital in western Hebron, where thousands gathered for news of relatives and friends who were in the mosque at the time of the attack. The army is reported to have killed 12 Palestinians as rioting erupted outside the hospital as feelings ran high in the aftermath of the shootings. Dr Daoud Obeidi, director of the Aghli Hospital, said from the shrapnel wounds suffered by some of the worshippers, it appeared hand grenades were used in the attack. Three hours after the attack, which happened at around dawn, hospital officials could still not say exactly how many were killed and injured. The Palestine Liberation Organisation has demanded that Israel disarm all 120,000 Jewish settlers in the occupied territories and that the United Nations act to protect Palestinians. Between 30 and 54 Palestinians are believed to have died in the gun attack by Baruch Goldstein in Hebron. An official inquiry later ruled that Goldstein had been working on his own and did not have an accomplice. 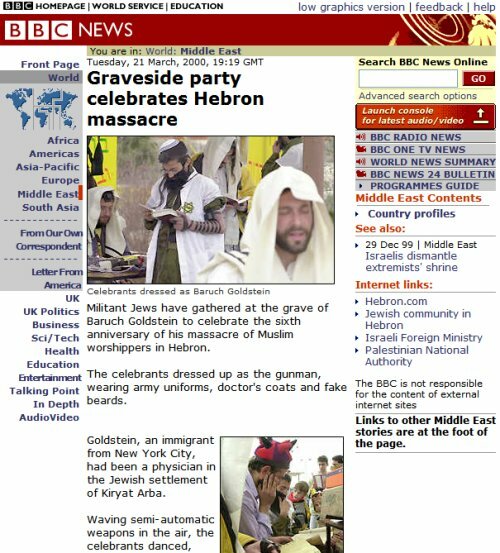 Goldstein had lived in Israel for 11 years and was a doctor in the Jewish settlement of Kiryat Arba, just outside Hebron. As the settlement's main emergency doctor he was involved in treating victims of Arab-Israeli violence. It is reported that his hatred became so intense that eventually he refused to treat Palestinians. Goldstein had been a member of the Jewish Defence League, a violent organisation established by Rabbi Meir Kahane. Some settlers treated Goldstein as a saint, establishing a shrine to him that was forcibly removed by the Israeli Government in 1999. Goldstein is not the first American behind an attack against Palestinians in Israeli-held areas. In 1982, Alan Goodman staged a shooting spree outside the holy Al Aqsa mosque in Jerusalem, killing two people.